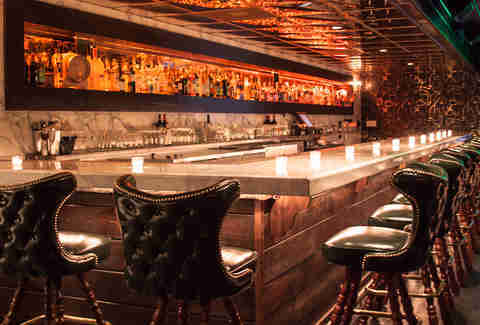 A sweet K-town speakeasy. Behind a sketchy door. 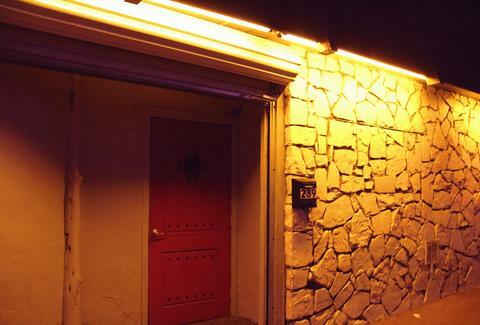 On such a bizarre stretch of Vermont that the only way to describe it is "across from the Vons", Lock & Key is a speakeasy totally hidden behind this unassuming/terrifying unmarked red door. Knock on said door and a dude wearing a bowler and ascot will answer and let you in. PRO TIP: Don't ask him if he's in Mumford & Sons. 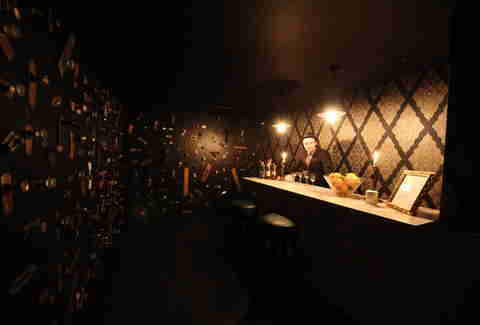 Once inside, you'll enter this room with a tiny bar, and the dude NOT from Mumford & Sons will ask what you want to drink. But there are no drinks. There are, however, lots of doorknobs on your left and in the back, and you've got to guess which one is real. Find the right one, and… You'll hit a real bar! Finally. My god, man, you're so thirsty. So grab a stool and talk to this dude, who's a big-time European sommelier and probably knows the dudes in Mumford & Sons, though don't ask him that. Instead ask him to make you a drink focusing on aroma. 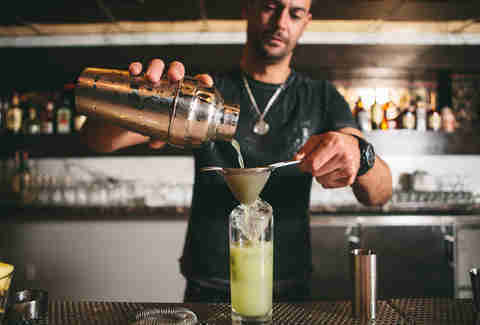 Like this "Torpedo", which will sink your doubts via pear vodka, maple syrup, ginger juice, lime, and those three dots of sesame oil, which add a unique smell and look cool. 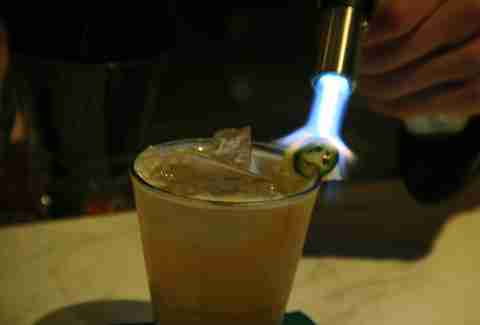 They're also playing with fire: this is the mezcal/pineapple/pepper/apple "Shady Schemes". 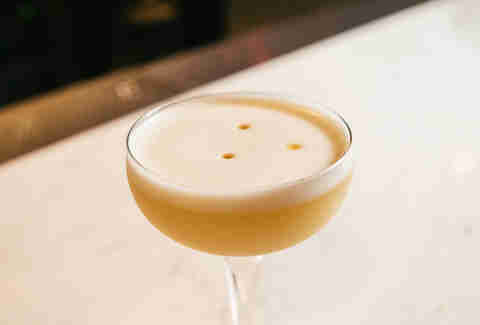 Or maybe you want the "Daisy B. 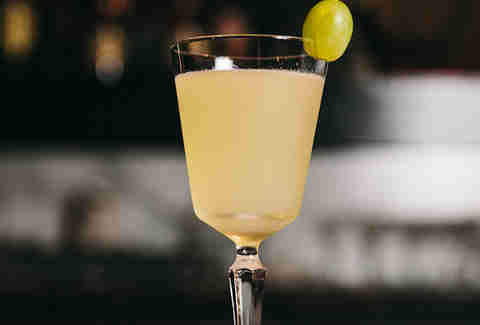 ", which is not a hip-hop remake of The Great Gatsby, but instead, a mix of grape, lemon, elderflower, and Sauvignon Blanc. 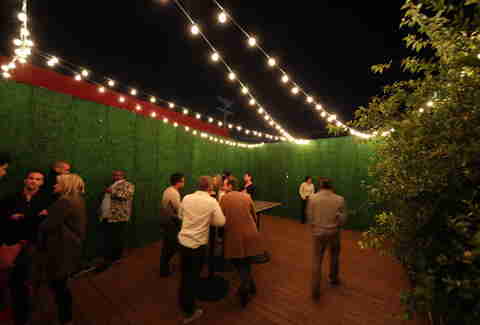 But wait, there's more: a patio where you can smoke (!) while sipping your booze and eating take-out from their partner, Stall 239, all under lights that definitely weren't stolen from a Mumford & Sons concert, so don't bother asking.